Background: In 2011, bonnaroo BUZZ made the jump from scoop shop only to a pint container. 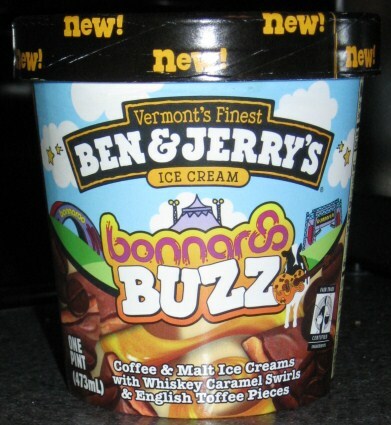 In 2012, at the end of the bonnaroo music & arts festival, this flavor became Coffee Caramel Buzz. The flavor has now been cancelled and will not make it in to the 2015 non-GMO lineup. The bad news is I really don't like this "unique" combo of Coffee & Malt Ice Creams with Whiskey Caramel Swirls & English Toffee Pieces. Sound weird? Tastes even weirder. My wife said something like "that doesn't even sound good". Yeah, she's right. Sure, I like caramel and toffee, but in this particular combo, it's just not enough for me. Now this came right from the deep freezer yet it was soft and smushy..... I'm hoping it's just the ice cream and not my freezer! Now by appearances it looks like mostly brown coffee ice cream with small malt swirls. There are tan whiskey caramel swirls, and the occasional toffee piece. 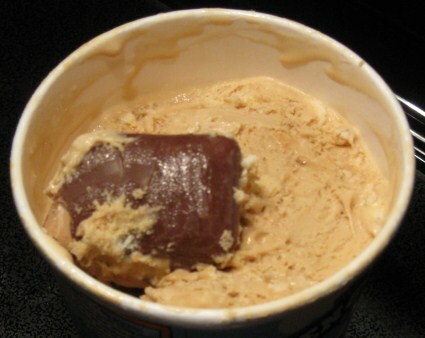 Ofcourse I ate that toffee piece first that you see at the top of the pint. After that I attempted to dig in. I didn't like this from the first bite, but I ate the whole bowl I scooped to be fair. If I'd have to describe the flavor, I'd say it reminds me of licking the wet bark of a maple tree. Ok, that's not a very nice thing to say, but there is a very powerful flavor overriding everything. Not sure if it's the whiskey, or some whiskey malty coffee combo, but it's unpleasant. I tried focusing on the toffee and caramel but it just wasn't working. To be honest, I don't even want to go back for a second scoop. So, as I expected, this flavor is meant for a select few. I suspect that many of you will try it once since it is Ben & Jerry's, but man, I don't expect this one to go far.... but what do I know, this flavor survived a year in the scoop shops, so someone is buying it! Am I being too critical? let me know! On Second Scoop: Commenters mentioned it is the whiskey that is adding that woodsy taste to the whole thing. I tried some more but then decided to rescue any toffee pieces I could find and then throw the rest in the trash. Sorry, this one's just not for me. For a completely opposite opinion, check out Gigi's review of bonaroo buzz. I just wanted to point out the Gigi, from Gigi review, reviewed this flavor and loved it, I am talking 11 out of 10 here. Maybe this flavor is not for everyone, but there are definite lovers. I have a pint in my freeze right now and CANNOT wait to dig in once Lent is over. Also, can we get a review of Ben and Jerry's Oatmeal Cookie Chunk from you? I would be interested on your take. Sounds like a hot mess to me. Or should I say "cold" mess?? Well, even greats like B&J's make a mistake. I didn't like it in the scoop shop...though at first I thought it was a "banana coffee" ice cream because I misread the title. I can't wait to get back to America and get my hands on Clusterfluff. I don't think I would like this either... I recently tried Clusterfluff and WOWOWOWOW. That stuff is DANGEROUS. I totally forget she reviewed this last year, thanks for the reminder. I find it funny that she used the term "woodsy" since I made the tree bark comment. This flavor is definitely meant for a very particular audience. totally disagree. i loved everything about this pint even though i don't like coffee and had low expectations for this flavor. the toffee pieces were amazing and authentic, and the whiskey swirl was addictive. I love coffee ice cream and this pint is my fav of the 4 new flavors..def a 10 out of 10 for me! 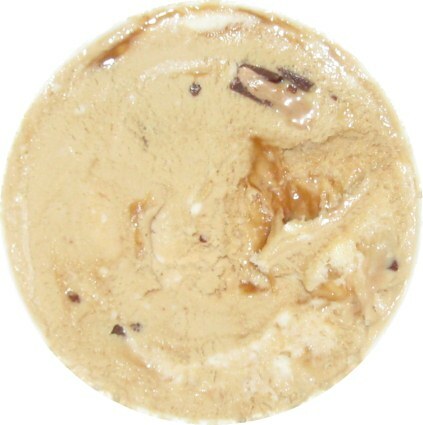 I def tasted the heavy whiskey swirl and like you Dubba I got a huuge toffee chunk in the center of my pint. It also gave me a woodsy feeling like you've been hanging at the music festival all day. It also reminded me of Dublin Mudslide, another of my B&J favs! i'm going to have to agree with this gigi gal on this one. anytime you mix coffee and malt together, only greatness can come of it. but how the heck did she get to try this flavor last year. i'd never heard about it until your recent posts about it. are certain sections of the country being denied access to certain b&j's flavors? what the frack? Tried this yesterday and thought it was fantastic. Might be worth a revisit! I know i'm late to the party here, but I just tasted this for the first time and my favorite ice cream was already B&J's coffee heath bar crunch so when I tried this I fell in love! Hope you won't just take this guys work for it folks this flavor is delicious! Also one of my favorite things about the coffee heath bar crunch was the generous pieces of Heath bar they would put in there and I love they do the same thing in this one. Other companies are so stingy and have tiny little pieces u can hardly taste. When something really bothers me and someone comes along and says they can't taste it at all.... yeah, I have trouble believing them. I have long know this is a favorite among many, that doesn't mean we all understand it though. I just tried this flavor and OMG it is AWFUL-- a complete and total miss for me. I love coffee ice cream, I love caramel, and I love whiskey. Since I love coffee with caramel, I think the addition of whiskey is what ruined it for me.